I know how to define a package or a class, but how do I make it available (to myself) at all times? Say I have the package file commonstuff.sty (or myprettyclass.cls), that I want to be able to include in any .tex file I create on my computer. Where do I put it? Do I need to run some installer on it, or is it enough to keep it in a certain folder? Note: I know I can just place it in the same folder as the .tex file, but that's not what I'm after here. I'm looking for a way to "install" the package centrally on my computer. but it might also be ~/texmf/ on a Linux or Unix computer. Regarding MiKTeX, have a look at the section "Installing sty or cls files" in the answer to the question How can I manually install a package on MikTex (Windows). This will show the path to the file picked up by the TeX implementation. All of the other answers cover things quite well, but I thought a slightly different version might be helpful. Note: the local/ folder might not exist; in this case, go ahead and create it. A few of notes on that. First, on Windows the 'Users' part of the location is language dependent. Second, I've represented your home/user folder as '<user name>': this will obviously be dependent on your system. The folder I've indicated may well not exist: you may just have the texmf part, bits within that or nothing at all. The file location is important, and although you could just put your file inside texmf/tex/latex is is usual to keep things organised by package. The local folder is reserved for stuff installed on individual machines. Letting TeX 'know' about the file means running a program that builds a database of file locations. There are graphical interfaces to do this, but the way that works on all operating systems is to use the Command Prompt/Terminal and type texhash. This will build the databases for your tree (the one that is in your home folder). Once the 'hash' is created TeX should be able to find your file. For recent TeXLive distributions, this step is not necessary for files in the local folder. As already mentioned by Arthur, .sty or .cls files must be in some subdirectory of tex\latex which can be in any directory of any drive. See the following screenshot, it shows how the path to my packages and classes is. I will explain two cases, registering to MikTeX and registering to TeX Live. Open Settings (Admin), select Roots tab, and add my path E:\A\My LaTeX\MyLibrary. Note that the trailing \tex\latex\misc must not be included ! Afterwards, select General tab and press Refresh FNDB button. See How to register my own packages or classes in a separate drive to TeX Live installation? as well as other directories. You want to put it in the texmf-local directory, not in the other directories that are managed by the TeX Live installer; when you upgrade TeX Live, your package may be overwritten. The texmf-local hierarchy, as the names hints, is for local packages managed by you; it won't be touched by updates (which is also why it's directly under the texlive directory, and not texlive/2009, for instance). You may also choose to create a directory called texmf in your home directory, and the package will be visible only to you, not the other users on your computer. On Windows with MiKTeX, I believe the directory for local installs is C:\Localtexmf by default. In any case and whatever your distribution, you have to place the .sty file inside .../texmf-local/tex/latex and not directly in the root directory; it's just won't work otherwise. Then, if you've installed the package in your home directory, you have nothing to do. If you've put in texmf-local, on the other hand, you need to run the utility mktexlsr (or texhash, it's an alias). to your .bashrc file (you can add multiple directories, separated by colons. I think you do need the '.' in the beginning). There may be something similar in Windows. I find this easier, since it separates "my" stuff from the texmf tree. Probably not great if you're writing a big package, but handy for some small things you just want to share between all your projects. 6.2. Which is the best directory to keep .sty files where MiKTeX can find them? 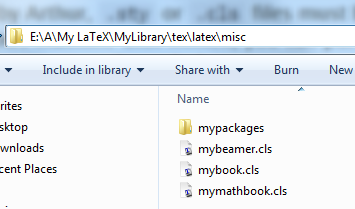 MiKTeX Package Manager takes care of the proper installation of well known LaTeX packages. Create the root directory C:\Local TeX Files. 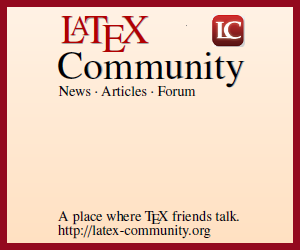 Create the sub-directory tex\latex\misc and copy your input files (*.sty, *.cls) here. 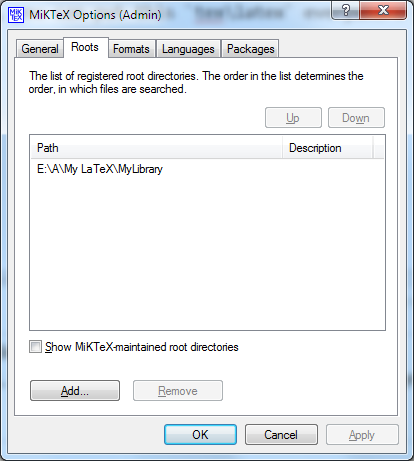 Register the root directory (C:\Local TeX Files) in MiKTeX Options. For more information, read the section Integrating Local Additions in the MiKTeX manual. For me, using MAC OS X with standard MacTeX, the above answer were only partially helpful. I couldn't find the directory ~/Library/texmf. I did the following. Assume that you want to add mystyle.sty to your TeX. Create the directory ~/Library/texmf/tex/latex and place mystyle.sty in it. Afterwards invoke texhash ~/Library/texmf/. The other answers provided to this question all suggest to put your .sty files in the folder /texmf/ in your user profile folder (although there doesn't seem to be any agreement on what exactly you need to do after that). This will, however, not work if you (like me) are using a portable LaTeX program, because then there won't be any such /texmf/ folder on your computer. To maintain full portability of your LaTeX program, you can put your .sty files in a LaTeX subfolder, e.g. C:/texlive/foo/. This way you can keep all your .sty files in one single place on your computer, and include the same path with \usepackage in all your .tex documents. I am using a quick fix to this issue since I work mainly on a USB stick and don't want to touch to the tex folders the computers I am using. Indeed, you can specify backward directories to \usepackage, then you don't have to know the exact full path but only the relative path from your .tex to your .sty file. Each subdirectory for which I build latex code references this rule, resulting in the .sty file to be copied locally to that directory before pdflatex is invoked (using suitable dependency rules). See for example, notes/make.rules and notes/phy452/GNUmakefile in my physicsplay github repo. This works well for me on Linux (ubuntu + TexLive) and Windows (cygwin + MikTex). Not the answer you're looking for? Browse other questions tagged packages installing document-classes texmf or ask your own question. Texlive 2013, where to place custom themes? 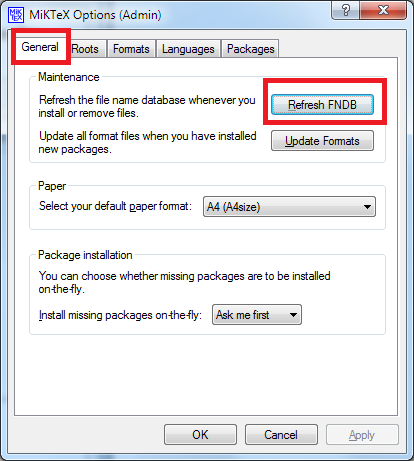 Where should I put my package files in TeX Live 2013? How and where can I install threeparttable.sty? A more see-through Tex distribution for Mac? How can I install a .cls file with MikTeX?